Many of us feel as though there are’t enough hours in the day to accomplish what we want to. As a result, we find ourselves upset with the state of things. We aren’t as productive as we’d like to be. We don’t have enough time to do the things we really want. In some cases, it can help to change the way you think about how you do things. 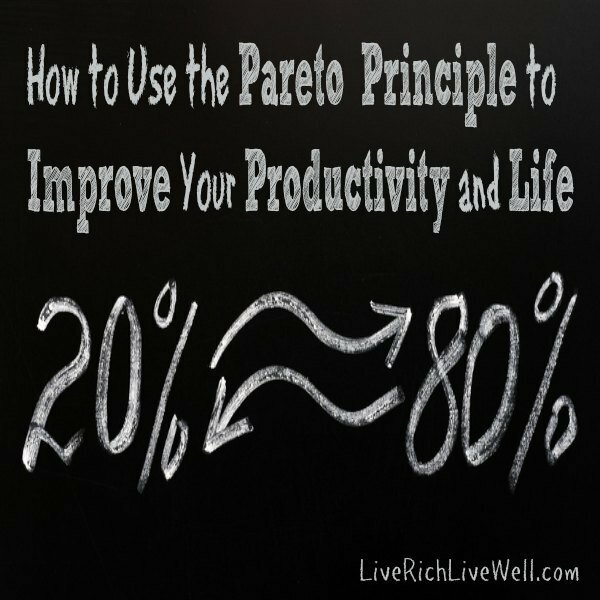 One of the best ways to change your outlook, boost your productivity, and improve your life is to use the Pareto Principle. This principle was discovered by an Italian economist in the early 1900s. He noticed that 80 percent of the land in Italy was owned by 20 percent of the population. Over the years, productivity experts, economists, and others have noticed this is the case in other areas, not just land ownership. In terms of productivity, the Pareto Principle is also known as the 80/20 rule. Basically, it suggests that 80 percent of your results come from 20 percent of your efforts. However, it’s not so simple as cutting your workload to 20 percent of your former efforts. The Pareto Principle instead forces you to carefully consider the way you use your time and identify when you are most effective. The first part of using the Pareto Principle in your life is to recognize which things are producing the best results in your life. Pay attention to when you are most productive. Look at when you are have the best quality interactions with friends and family. Take a look at your own habits, and realize that, in reality, a very small portion of your time and efforts are producing most of your results. Once you understand this, you can start to focus on the things that matter most. When it comes to productivity, it makes sense to focus your work time around the 20 percent of the day that you are most active and productive. If you spend 10 hours a day working, chances are that most of your best work is done in two hours’ worth of time. Your job, if you want to be more effective, should focus on doing the most important things during the two hours you are most productive. If you work for someone else, clearly you can’t just quit working after two hours. But if you want to get more done, or get the most important things done, you should prioritize and do the most important things during the 20 percent of the day that you are feeling best and most alert. This works with the rest of your life. In relationships, chances are that the best results come from 20 percent of your friends. Rather than spending time and energy on the 80 percent of your friends that only offer so-so relationships, focus on those friends that are true friends and enhance your life. You can also apply this to hobbies and other activities. Identify the 20 percent of activities that bring you the most joy in life. Rather than wasting time and energy on things that don’t bring you joy, focus on the 20 percent that do. The Pareto Principle is about recognizing that 80 percent of what you do isn’t going to be as worthwhile in your life. Really examine how you spend your time, and identify the things that offer the best results in work and life. Then, focus on those things. When you apply the Pareto Principle, you will see that you can have a more fulfilled life, better relationships, and get more done. You might be surprised at how much better you feel.